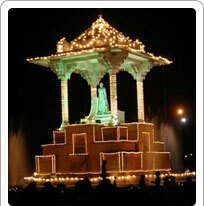 Statue Circle Was Made In The Memory Of Maharaja Sawai Jai Singh, The Founder Of Jaipur. It Is Jaipur City's Favourite Hangout Place. A popular landmark of Jaipur, it shows Maharaja Sawai Jai Singh holding an astrological diagram, in honour of his love for astrology. People of Jaipur visit the Statue Circle in large numbers, particularly in the evenings, as it is very centrally located and is a trendy meeting place. There are plenty of hawkers around vending the mouth-watering street foods of India, giving the Statue Circle the ambience of a picnic zone. There are colourful fountains and lighting around, giving a cheerful air to the entire area. The Statue Circle is a fitting tribute to the great ruler, builder and futurist.